Women are defined by their breasts. We shouldn’t be, but we are. From the time we’re young girls, we stuff our training bras with socks to see what we might look like as women. We start to bud and boys start to notice. We wear clothes to make our breasts stand out – or maybe not stand out too much. Boys label our breasts – cantaloupes or cherries. Our breasts become tools of attraction, but they’re also functional. We feed our children with our breasts. When our breasts begin to sag, we think back to our youthful perky breasts. Maybe a lift isn’t such a bad idea after all. But what about getting breast cancer? More than pink ribbons and charity walks, breast cancer is a disease that will disfigure a woman’s body and potentially rob her of her breasts. How does a woman diagnosed with breast cancer – someone you love – handle that news? According to the latest statistics from the American Cancer Society, 108 women die of breast cancer every day. Although breast cancer isn’t always a death sentence, a certain mystery surrounds it. There are treatment options and opinions about preventing breast cancer, but no cure has been found. Not until breast cancer is experienced firsthand do we know how it will test a woman’s strength. Facing breast cancer is a personal journey with one goal: to live. This is a story about my mom, Conchita Linda Santiago Argento, who was diagnosed in January 2013 with breast cancer. It was barely two weeks into 2013, and my family had a lot to be thankful for. Mom and Dad had plans to go to Florida in February. They would celebrate their 49th wedding anniversary at the end of summer. My brother Steve and I were happy and busy with our lives. Mom’s three grandchildren were almost teenagers, and her mother Evelyn, 91, lived nearby and was in pretty good health. Mom’s father, Ramón, living in Madrid, Spain, would celebrate his 96th birthday at the end of January. Mom had a mammogram scheduled, but with so many things to do before a dinner party she was hosting, she thought of postponing it a few months. When she called the center to cancel, the receptionist offered her an opening the following week. I’m glad she took the appointment. On Wednesday afternoon, Mom went alone for her routine mammogram appointment. However, the radiologist saw something in her breast and ordered a second mammogram. An ultrasound and biopsy of the tissue followed. Mom left feeling unsettled and with the understanding that she would hear her results on Friday. At 5:00 p.m. on Friday, Mom received the call. The radiologist discussed the steps Mom needed to take – an MRI, followed by surgical consultation. Her life flashed before her. “It was very painful to hear those words,” said Mom, who never thought she’d hear them, since she had no family history of breast cancer. My family and I had just returned from a trip when Mom told us the news as she drove us home from the airport. My heart sank, but she seemed composed, especially when my eleven-year-old asked, “Is it the hair kind of cancer, Grandma?” At first, she didn’t understand what he meant, until after a few probing questions. To him, cancer makes you lose your hair. His friend’s mom wore a wig during her treatment. My friend Karen, who was battling ovarian cancer at the time, wore a wig until her hair grew back after chemotherapy. Dad was away, so I took Mom to the MRI appointment. I wanted to help and support her any way I could. However, waiting for news was nerve wracking. A few days later, the radiologist called Mom and confirmed she had cancer in her left breast. In addition, the scan detected a possible cancer in her right breast and what appeared to be a small mass in her lung area. She needed a second MRI and a biopsy of tissue from her right breast the following week. With Dad back home, we took Mom to her appointment. The results turned out better than expected. The MRI revealed there was no cancer in the right breast and no need for the second biopsy. As for the mass, Mom needed an X-ray and CAT scan. Although the results from these tests showed no signs of cancer in the lung area, there was a mass near her heart. An ultrasound with a cardiologist found nothing. We were all thankful. After hearing the words you have breast cancer, Mom began to pull her resources together. She needed answers to her endless stream of questions. She also needed to talk to other women who knew what it was like to have a breast cancer diagnosis like hers. Mom contacted the Breast Cancer Coalition of Rochester (BCCR), since she was already familiar with its history of helping newly-diagnosed women with breast cancer. Holly and her staff shared “Dr. Susan Love’s Breast Book” – a great resource for women – in addition to other helpful information. They also put Mom in touch with others who were willing to share their stories. Odds are that one out of eight women in the U.S. will get breast cancer during her lifetime. However, statistics only tell part of the story. Ten years ago, Mom went to Florida with three of her girlfriends; to date, three of the four have had breast cancer –including Mom – and one died. “It was really helpful to have you and Dad looking out for me,” Mom told me. After the doctor explained her surgery options, he believed that a lumpectomy would produce the same outcome as a mastectomy. His goal was to keep her breast looking like a breast and only remove a wedge of tissue. On March 13th, just before Mom went into surgery, a new Pope was elected to lead the Roman Catholic Church. She felt that the white smoke was a good Omen, and she put her cancer in God’s hands. The surgeon was able to remove all the cancerous tissue and the pathology report confirmed it. No radiation or chemotherapy would be needed. Once you say to someone, “I have breast cancer,” you belong to a tribe of women who know what it’s like to fight for their lives. So many women want to share their stories in the hope of giving strength to others diagnosed with breast cancer. Mom wanted to do that, too. Not long ago, she spoke on the phone to a woman who had recently been diagnosed with breast cancer. The woman wanted to know everything she could. After Mom told her story, the woman thanked her. “After all the support I received from breast cancer survivors, I was so happy that I could share my story and answer her questions” said Mom. Having a community resource like BCCR that Mom could turn to was an important first step in understanding what she was up against, taking charge of her health, and knowing that she wasn’t alone. 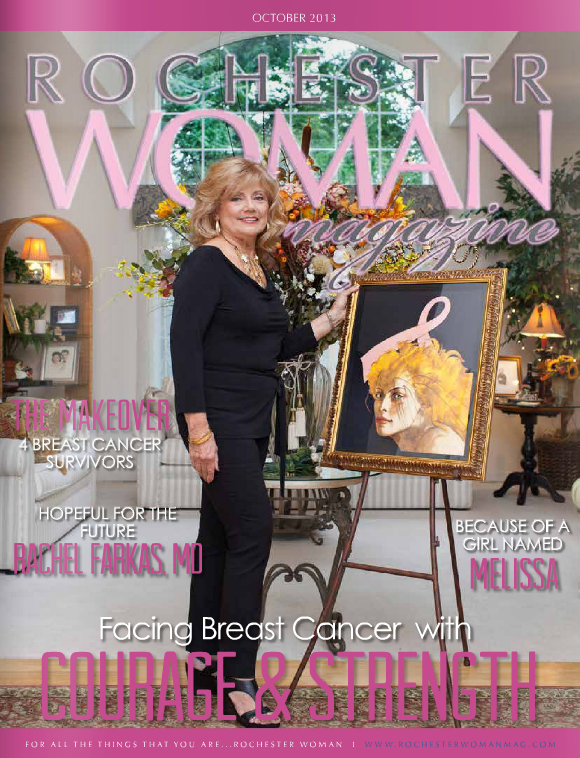 (This story first appeared in Rochester Woman Magazine, which is now defunct).